It is with much sadness that I write this memorial post. 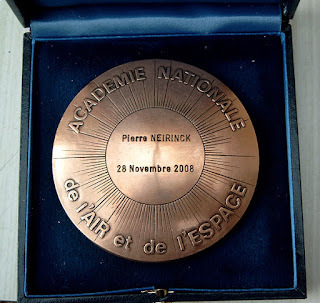 Yesterday, I was informed that Pierre Neirinck passed away last Sunday at the age of 89. 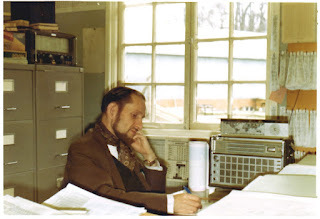 Pierre was a big name in our field and the nestor of our satellite tracking community. He was one of the very first amateurs to do serious positional observations on satellites, at the very dawn of the Space Age. Below are photographs which Pierre made at Malo-les-Bains, France, of a pass of Sputnik 2 on 13 April 1958, and of a pass of the Sputnik 3 rocket on 7 July 1958. 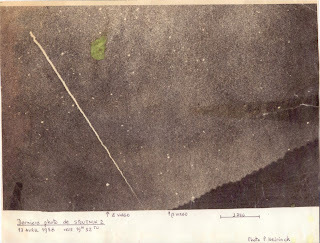 A positional observation of Sputnik 3 by Pierre done in 1959 can be seen here, courtesy of Ted Molczan. Before the Space Age started, Pierre studied the relationship between weather and solar activity and observed meteors, accompanied by his black cat Mickey "who mewed each time a meteor cross the sky" (private comm., 30-10-2012). 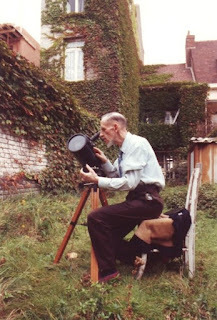 His love of cats was something Pierre shared with a number of satellite observers. Born in France in 1926, Pierre got the opportunity to turn his hobby into a professional job at the Satellite Orbits Group in Great-Britain from 1966 to 1982, where he was the driving motor behind the satellite prediction service at the Radio and Space Research Station (RSRS - in 1974 renamed to Appleton Laborotary) in Ditton Park, Slough. In this capacity he conducted orbital analysis and provided pass predictions to observers, as well as doing observations himself. He is explicitly mentioned in the memoirs of Desmond King-Hele ('A Tapestry of Orbits', Cambridge University Press, 1992), a renowned British satellite scientist at the RAE who greatly benefitted from the data flow generated by Pierre's activation of the amateur tracking network. His comments capture Pierre's extraordinary 24-hour passion and zeal for his work, remarking at a point that Pierre sometimes seemed to be two persons: "Pierre by day and Pierre by night" (King-Hele 1992, p. 138). After his early retirement in 1982 (due to a reorganization of the British governments' satellite tracking establishments), Pierre went back to Malo-les-Bains in the north of his native France. 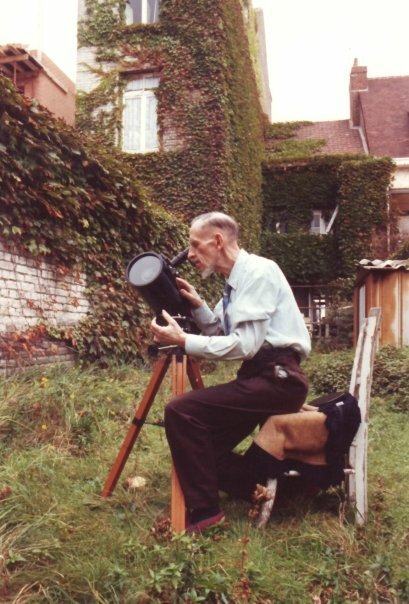 This did not mean he stopped his activities: until very recently he still actively tracked satellites and analysed orbits, sometimes going as far as climbing on ladders to glimpse a low Keyhole pass over the rooftops, even when he was already well in his eighties. Moreover, behind the scenes he remained a central figure in the vitalization and coordination of amateur satellite positional observations, right up to just weeks before his death. He distributed COSPAR site codes to new observers and new observing locations (the last one he issued was for site 2752 on December 21, 2015, just two weeks before his death). He also distributed orbital analysis based on his own observations and the data we provided. Only the last two years or so, his declining health started to interfere and he was forced to stop active observing. Active satellite observers, including me, until very recently received his charmingly idiosyncratic semi-daily e-mail dispatches (before my time, these were photo-copied notes distributed via surface post and fax - one of those is featured in Bob Christy's in memoriam for Pierre here). These e-mail dispatches featured his observations and orbital analysis (notably of the KH-11 'Keyhole' satellites), which were mostly done on an ancient Commodore computer, sometimes a note on his health or activities, old memories (often about WW II) as well as frequent brief ironic comments on world affairs, including geopolitics, sports (tennis notably), natural disasters, crimes in the news, scientific discoveries, and often presenting a brief tally of who had left our planet in violent ways the previous days. In private e-mails, he used to reminiscence about the squirrels and dragonflies at his old workplace in Ditton Park, and the sparrow visiting his window at Malo-les-Bains every morning. Pierre was an enthusiastic and talented photographer, and his photographs sometimes featured in exhibits ( I regret that I can no longer find his fantastic self-portrait, called "auto-portrait", capturing himself in an automobile side mirror, which he once sent me). Pierre's contributions were deservedly recognized. In 2005, he received the Prix Jacquemetton d'Astronomie from the Société Astronomique de France. In November 2008 the French Academie Nationale de l'Air et de l'Espace awarded him a Bronze Medal for "his life’s work devoted to space observation". That same month, the International Astronomical Union on my initiative named asteroid (142014) Neirinck in his honour, as was already mentioned above. Over the years, developments in Pierre's health frequently worried us, but he always recovered. We used to think he would live forever. With some Dutch/Belgian observers we were actually making plans to visit him at Malo-les-Bains one of these days. Alas, it will not be. The satellite observers community will miss him, and remember him as one of the Great ones. As with Marco, I was late to the game, active in astronomy since a teenager, but only discovering the joy of tracking satellites in 2003. Pierre was quick to contact and support me (as were all in the community), and those emails were a treat - informative, challenging, and always strictly Pierre. He will be missed, even by those of us who are building on what he and the other greats started. Well written, and thank you for honouring this pioneer. I worked with Pierre at RSRS and he introduced me to satellite observations for real, running about in the field with his binoculars and enthusiastically telling me when and where what satellite would be seen. And so they were. I had already been interested in satellite-spotting so this kindled an even greater interest. An entusiast that won't be forgotten - but will be missed.